This week’s landmark study of protected bike lanes from the National Institute for Transportation and Communities is a big step in understanding them: not only what they can do, but what they can’t. Here are three interesting things the study showed protected lanes, for all their advantages, can’t do. 1) They can’t rapidly boost citywide bike ridership without a network. 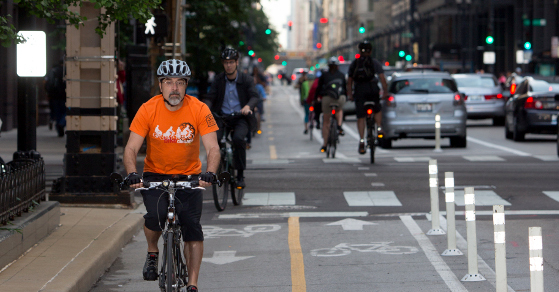 Chicago’s developing network of buffered or protected bike lanes. Blue projects are built; red projects are planned. On Tuesday, we wrote that protected bike lanes tend to increase ridership on a street by an average 75 percent in the first year alone. But as we also noted, about three quarters of those new users had already been using bikes for that trip — they simply adjusted their route to take advantage of the protection. That’s evidence that protected bike lanes are better to ride in than conventional ones. But it’s not the most important goal of protected lanes, which is to get a lot of people riding who aren’t. From Portland to Seville to Copenhagen, international experience shows that a robust network of bikeways is needed to dramatically change behavior. And there’s actually some evidence for this in this week’s report: of all the people surveyed who switched to bike from another mode, 38% were on the two Chicago bike lanes. It’s probably no coincidence that these are the only two projects that are part of something approaching a connected grid of such lanes. 2) They can’t always separate bikes and cars completely. The great challenge of a good bike lane, and particularly a good protected bike lane, is the intersection. Creating a bike lane means that if cars are going to be allowed to turn, they must either turn in front of bikes or merge with them. Several findings from the new study suggest that people like the stoplight method much better. Mixing zones at intersections can be designed to be safe. But this study strongly suggests that people don’t find them very comfortable. If the goal of protected lanes is to appeal to people who feel unsafe in conventional lanes, then mixing zones look like seriously weak links. 3) They can’t be created without at least a little opposition. Many findings in the new study suggest that protected bike lanes are, generally speaking, politically popular among people who live near them. Forty-three percent of people living near the bike lanes said they’d increased the desirability of their neighborhood. A strong majority said their opinion about them had only improved with time, and an overwhelming majority said they now support adding them in more locations. But the study also showed that protected bike lanes are not universally popular. Half of all people who live near protected lanes, including 61 percent of those who said their “primary” way of getting to work is in a car or truck, said changes to the neighborhood had made it worse to drive in. 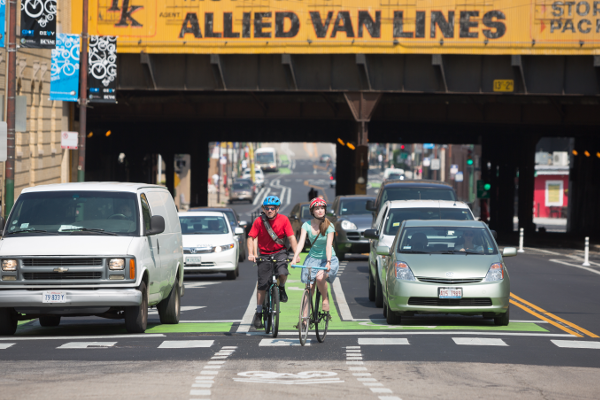 Twelve percent of nearby residents said the protected lanes made them more likely to visit a business on the street, but 9 percent said they made them less likely to visit. Only 24 percent of locals (and only 15 percent of locals aged 18-34) said they wouldn’t support protected bike lanes in more locations. But a solid 34 percent of people over age 65 were unsupportive. 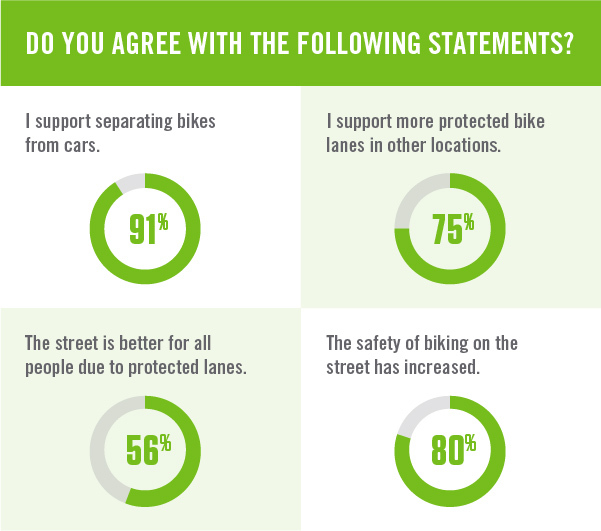 In general, the study provides strong evidence that most Americans in central cities would support protected lanes. What it doesn’t suggest is that they can be installed without any controversy. Cities that build these projects should expect some residents to object, in some cases loudly. But their leaders should also keep in mind that those who object don’t speak for the majority.